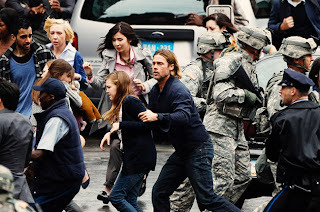 Aimless, clumsy and held loosely together by ropes of superficial flesh and weak storytelling muscle, World War Z is a disappointingly inconsequential entry in the oft-fertile zombie sub-genre. 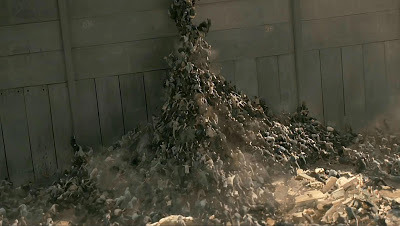 Lacking the rich socially conscious themes that fuelled the greatest undead entries – 28 Days Later, Shaun of the Dead and George Romero’s first few Living Dead installments – this liberal cinematic adaptation of Max Brooks’ popular novel is a plodding, stitched-together patchwork of half-baked ideas, unfinished CG and frantically-shot, bloodless chaos. It plays like a run-of-the-mill zombie b-movie that’s been aggressively over-edited for network television. Beleaguered by tumultuous production woes – including a totally reshot last act reworked by Damon Lindelof (Lost) and Drew Goddard (Cabin in the Woods) – director Marc Forster’s budget-busting blockbuster starts reasonably strong, with former U.N. investigator Gerry Lane (Brad Pitt playing, more or less, himself) and his family uprooted after a sudden biological outbreak in Philadelphia. 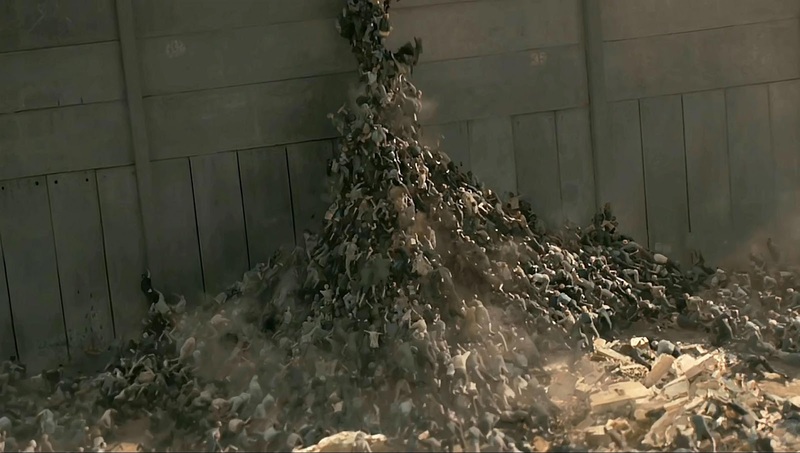 Cars slam into one another, buildings explode and infected civilians spasm on the streets like epileptic break-dancers as the clan desperately flee the city-wide pandemonium. After being taken into government safe-keeping, the suddenly invaluable Gerry is ordered to travel the globe, visiting locales such as South Korea, Jerusalem and Wales, in search of the elusive "patient zero." There’s a kernel of an interesting movie at the heart of World War Z – how do differing cultures and religions perceive zombie invasions? – but Forster is more fixated on delivering dumb spectacle than smart commentary. The central plot – penned by Matthew Michael Carnahan (State of Play) – simply features Pitt repetitively location-hopping in order to meet nameless non-entities (David Morse and James Badge Dale among them) who spout exposition reminding us that this plague is, indeed, not so hot for humanity. He also endures clashes with the undead. Some are modestly effective, including a small-scale science lab set-piece (awkward Pepsi commercial break notwithstanding), whereas the big money moments, such as the heavily-advertised wall-climbing horde, look too phony to be scary. More troubling is the fact Forster, who notoriously butchered Bondian action in Quantum of Solace, takes a similarly fractured approach to monster attacks, fast-cutting them to the point of disorienting disarray. Add on murky 3D and you have yourself a feature-length cataract simulator! Because we have no well-rounded characters to root for, and the story’s a shambles, the picture is drained of tension. The zombies have a nifty avian physicality, and their cooperative drone mentality is fun, yet their abilities are wildly inconsistent. One second they’re downing a helicopter, the next Pitt is trying to thwart them with a blockade of baggage. Plus, by now we’ve seen these creatures done well so many times that lazily mechanical PG-13 bedlam just doesn’t cut it. 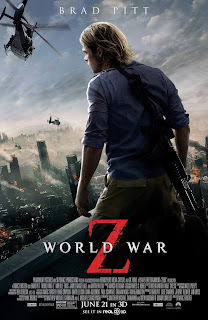 And that’s World War Z’s major undoing; it yearns to generate unease and visceral terror, albeit subdued for mass audience consumption. Unlike, say, Spielberg’s War of the Worlds or Soderbergh’s Contagion (also both PG-13-rated), the threat never cuts to the bone or haunts us. Rather, it shuffles perfunctorily along, short on imagination and intelligence, fighting dimly in vain to generate a flicker of a pulse.